The white birds were calling as they soared over the beach around Mhumhi, who had slowed to a walk. Their cries obscured his own tentative hoo-barks. Vimbo had stopped whooping, but he was close- Mhumhi had come across his broad tracks in the sand, interspersed between crusted bottles and flapping bits of plastic. The seawater had receded, leaving behind lines of thick white foam and a foul smell. Mhumhi nosed what he thought was a bit of plastic and jumped when it yielded easily under his nose. It was startlingly squashy and slimy, a flattened transparent thing upon the sand. He raised a paw and gave it a tentative prod, then yelped. It stung. He hobbled quickly away, shooting wary glances backwards- he’d have to be more careful about where he stepped. Luckily the twinge in his paw was already fading. He heard a familiar giggle, and looked forward again. Vimbo was standing a little ways away, up to his ankles in the surf, appraising him with his ears forward. He looked slightly the worse for wear, with ragged marks on his flanks and that permanent sneer from having his lip ripped. 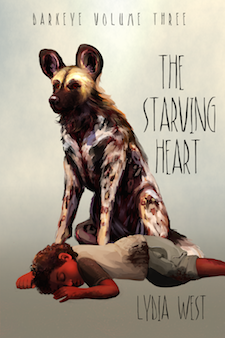 Mhumhi forgot the pain at once when he saw him, his tail wagging low. Perhaps it was guilt, from the way he had last abused the hyena- physically and in his own head- or perhaps it was simply how glad he was to see him again. Whatever the case, he ran to him, twittering with excitement, his ears back, his mouth grinning. Vimbo drew his head up as Mhumhi came and licked his face, wagging, splashing around him. Vimbo backed away from his assault, which sent a rush of guilt through Mhumhi for real; he was certain to remember how Mhumhi had bitten him the last time they had seen one another. And the last time they had seen one another, Vimbo had just killed three painted dogs. He hesitated there, with his paws in the water, eye to eye with the hyena. The birds were circling high overhead. He wondered if they somehow anticipated bloodshed. Vimbo took a few sloshing steps sideways, until he was at the very edge of the waves, and ducked his head. Then he raised one leg. Mhumhi went after him again, wagging furiously and twittering up a storm, and even exchanged a polite sniff of the underparts with him. Vimbo uttered no sounds, just leaned against him a little. Mhumhi’s heart beat a little painful even as he staggered a little to support the heavy gray form. Had Vimbo been afraid that he would not be forgiven? He licked the hyena’s ears, barely recalling the time when such an action would have repulsed him. After a time they separated, and Vimbo loped further up onto the beach. Mhumhi fell into a play-bow, almost unintentionally, and chased after him. Vimbo gave a little squeal, and for a moment Mhumhi was not sure he knew they were playing; but then he turned and gave him a shove with his heavy shoulder. Mhumhi toppled over, sand flying, and Vimbo stopped short. Perhaps he had not intended to use quite so much force. But Mhumhi was game to it. He pawed the hyena from his position on the ground, curling sideways in the sand, his tongue hanging sideways. Vimbo aimed a few gentle snaps at him and then seemed to come to a decision. He went limp and flopped down heavily on top of Mhumhi, completely knocking the breath out of him. Mhumhi laid there for a moment, relaxed (and a little stunned). It seemed to him that he had not played like this in a long time. Perhaps Vimbo’s muteness had helped with that- there were no words that they had to exchange, nothing to get in the way of the simple feeling of it all. Vimbo’s coarse spotted pelt rose and fell with his breath, and Mhumhi could hear his powerful heart thudding where they were pressed together. He squirmed a little, and Vimbo rolled over, freeing him. Mhumhi did not get up straightaway. He stared upwards at the birds circling round and round above them in the crisp blue sky, like bad thoughts. Vimbo got up and shook himself a little, making Mhumhi squint and flinch as a sheet of sand fell down onto him. The hyena walked a little ways up the beach, in that hulking manner of his, and scratched at the wet sand. Mhumhi got up and went to sniff curiously at the spot, thinking that Vimbo had found something interesting to dig up, but the hyena shouldered him away. Rather perturbed, Mhumhi stepped back and trotted a bit further away, keeping a sharp eye out for any more stinging things. Vimbo now seemed totally absorbed in whatever he was scratching at in the sand. He dug a long straight line, then walked forward and began digging another one crossways. Mhumhi couldn’t help but be curious, as the shape began to get more elaborate, and he stepped a bit closer, only to shy away when the hyena gave him a look. It seemed he did not want Mhumhi to step where he had dug. Mhumhi cut a wide berth around it to look from a different angle, stumbling slightly over loose bits of trash. The way Vimbo was scratching out those lines seemed two deliberate. He tilted his head from side to side, then, as Vimbo began yet another line, it slowly dawned on him. The hyena was making words- words like the ones that were on papers or computers, only much bigger. He bounced and chittered with the realization. Vimbo glanced up at him. He paced back and forth a little, as in the meantime Vimbo went back to his task. There was a good chance of it- he’d yet to meet an adult hulker who couldn’t- but that was not the only problem. He’d have to get Sekayi, injured as he was, all the way over here, and even then he was under no illusions as to how VImbo felt about the other bouda. It bit at his heart. He couldn’t in good faith bring the hyena back to the fire pit with him. It was maddening. He stared at Vimbo, at his slow dedication to making shapes in the sand. Did he think, somehow, that Mhumhi had a means of understanding them? Or did he merely trust him to try? Mhumhi couldn’t help but give a faint whine. Vimbo did not look up this time. He had to try to understand them somehow. It was the only voice Vimbo had. Even as he thought this, a noise made his ears prick. Mini’s shrill howl was audible in the warm air, over the restless ocean and the birds. Vimbo raised his head too, sand covering his muzzle. “It’s Mini,” Mhumhi said to him. “You know, right? Mini.” He couldn’t help himself. He wanted VImbo to come back with him. Vimbo looked at him, his black eyes empty as ever. “Come,” said Mhumhi, jerking his head sideways, giving a little wag of his tail. Vimbo sniffed the air, bringing his ears forward so that the skin on his forehead wrinkled, and then he lowered his head and scratched another line in the sand. Vimbo ignored him. Mhumhi bounded forward and back, caught in his own frustration, but another shrill howl from Mini decided it for him. He had to attend to his family. He started forward at a trot. A glance backwards told him that the hyena was not following, though he was looking at him silently. Mhumhi swallowed and began running. He made good time and got back to the fire pit and the concrete building by the time Mini had started on her fifth howl. “I smell him!” he heard her yap, even before he cleared the last dune. He came down into the little valley, his nose twitching. Sekayi was sitting outside in his chair, his eyes half-lidded, and Mini was on his lap. At the opposite end of the fire pit lay Hlolwa, to all appearances sleeping soundly. “What?” Mhumhi came down beside her, glancing Hlolwa’s way. A sliver of amber was visible underneath her lowered lids. “You seem to be all right,” Mhumhi couldn’t help saying. Mini gave a tremulous growl. The words “You weren’t talking to anyone,” rested on the tip of Mhumhi’s tongue, but he couldn’t say them. It was good, in away, that her blood had got up again. Now Mhumhi snarled, opening his mouth at her. Across the pit, Hlolwa whuffed with amusement. “Something to say?” Mini shrilled at her, quivering. “Please, carry on,” said Hlolwa, with a dry chuckle. “You should’ve had your throat torn out a long time ago,” Mini said, swinging her gaze back to Mhumhi. He stiffened. “Mini,” said Sekayi, all in a rasp. Mhumhi was rather stunned, and stared up at Sekayi. His ruined face made it hard to tell whether or not he felt apologetic. Her tone was bone-dry. Mhumhi wanted to cringe. “If she’s telling the truth, where’d you go after the two of you separated?” demanded Mini, who did not look ready to back down just yet. Mhumhi felt a powerful sense of annoyance. Mini drew even further back at this, and then sneezed three quick times in succession. “It’s because you bit him,” said Mini, interrupting him. She coughed. Sekayi removed his hand from her back. “Mhumhi did what he had to do,” he rasped, and Mini seemed to deflate slightly. Sekayi blinked, and the uninjured side of his mouth twitched up. “Why are you asking?” interrupted Mini. “Has Vimbo found another computer?” She gave a little snort. That shut her up, for just a moment, as her eyes bulged further. “Are you sure it is writing?” Sekayi rasped. “He’s not-” began Mini, but Sekayi shifted slightly in the chair. “You’re still hot,” protested Mini, and he patted her gently. “All right,” said Mhumhi, disgruntled, and sat down. “I could go fetch her,” said Hlolwa, unexpectedly. When they all looked at her she gave her sharp smile. “I would be dead if that was true,” said Sekayi. That was something none of them could counter, not even Mini. Mhumhi stole a glance at Hlolwa; she’d turned her head the other way. Mhumhi looked up at him in surprise. To everyone’s surprise, Mini snorted. “You’re being sentimental,” she said. “What’s more natural than taking puppies away from their mother?” She gave a little laugh, as they all turned their eyes on her. Even Hlolwa cast her a sidelong glance. “It is not right,” said Sekayi. Mhumhi thought he sounded faintly wounded. Sekayi looked down at her. Some of his dense curls were sticking to the raw wound on the side of his face. Hlolwa turned around. Mini laughed. “Civilized?” said Hlolwa, tilting her head a little. Mhumhi caught a certain gleam in her gaze, and recognized it. Hatred. Mini was shaking so hard it seemed she couldn’t even speak anymore, flattening herself between Sekayi’s knees. Mhumhi could smell fear coming off of her. After a moment Sekayi stroked her back. Hlolwa gazed at her, struggling in Sekayi’s lap, with something bordering on amusement. Mhumhi, who had been unable to say anything for most of the conversation, finally found his voice. Hlolwa looked at him and gave a laugh that nearly sounded genuine. Such a bleak statement, delivered so calmly, made Mhumhi’s blood run cold. He licked his lips. Nobody said much after that, and Hlolwa lay back down in the dirt, shutting her eyes. Mhumhi watched her breathe, her heavy sides rising and falling. On Sekayi’s lap, Mini leaned away from his touch. It was getting dark by the time Kutta returned, and Mhumhi had to cede that they’d go to the beach the next morning instead. Kutta took his explanation more calmly than he’d thought she would. “At least Vimbo’s all right,” she said, in a mild tone. Mhumhi wondered if he wasn’t going to hear more about it later on. The next morning he and Kutta escorted Sekayi to the beach, with Tareq tagging along behind them. It was slow going, as Sekayi made use of a stick he’d picked up to lean on, and Tareq dragged his little feet. Eventually they glimpsed the greenish water from between the hills. Right away Mhumhi knew something was wrong. The water was roiling with bottles again, as it had been when he’d first seen it, and little sand was exposed. The tide had come back in. “Vimbo!” he called, sprinting forward through the shallow surf. He could recognize the place where he and the hyena had played- yes, there was the pile of trash he had slipped on- but Vimbo was nowhere in sight now. Mhumhi came to a halt, the water swirling at his ankles. The sand that Vimbo had spent so much time painstakingly writing on was completely obscured. After a few minutes Sekayi came hobbling and panting up behind him. Sekayi took a couple more steps forward, flinching when the warm water touched his toes. Mhumhi only hung his head listlessly. Sekayi moved past him, scanning the shallow water. Kutta and Tareq splashed after them as well, with Tareq tugging at Kutta’s neck and pointing up at a bird. Mhumhi’s ears pricked and he trotted over to where Sekayi was standing. There was a little alcove of sand under one of the hills of trash, just out of reach of the waves. Mhumhi saw lines scratched between old bottles and plastic bags. “There must have been more to the sentence,” sand Sekayi, looking at the water as it retracted backwards. Not a mark was visible in the smooth damp sand it left behind. It was little enough, but it was something Vimbo had said. Mhumhi turned his ears back and caught a faint howl. Mhumhi listened again, turning completely in the direction the sound had come from. It was not towards the camp, and when the howl came again, he realized Kutta was right. It was not Mini’s howl. “Mhumhi’s heart beat a little painful even as he staggered a little to support the heavy gray form.” little painful what? painfully? painful pattern? also, you use little twice in this sentence.